These are some quick instructions for anybody interested in connecting a NAS to Linux computers on a closed local network. 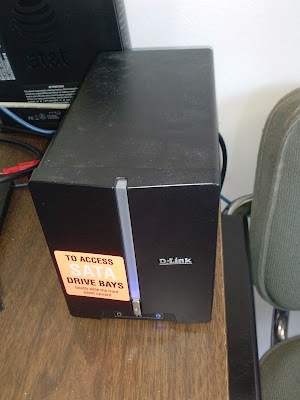 In particular, this guide will help to reconnect the NAS drive to the computers at the Artifice Tech Center in Woodlawn. A NAS (Network attached storage) device allows you to essentially connect hard drives directly to your network without needing them to be associated with a "real" computer. If you have a wireless router, you can just plug the device straight into the router. From the hardware end there isn't really much more to it than that. The device should have it's own IP address that you can communicate with from any other device on the network. To let other computers modify the disk drives in the NAS, you need to set up a shared folder on it. The machine case itself should have it's access point IP address printed somewhere on it. If for some reason it doesn't, you'll need to use other information printed on it to search the web or the address. Once you have the IP, you can connect to the NAS simply by typing that address into the browser on any computer in your local the network. To connect to mine, I navigated to http://192.168.1.32. You can find the specific instructions for making network shares on dlink's help site. The process is mostly self-explanatory. I made a directory called Artifice_Share, and set the permissions so that anybody could read or write anything. You'll have to adjust the IP (in red) to match with the device ID for your particular NAS. After you restart the computer there should be 2 folders on the Desktop both named Artifice_Share. I don't know why two show up, but it doesn't seem like it's causing any harm.